The plans for the August project in Ivancea, Moldova are now in place and TEECH would like to thank John McPherson for once again taking the time to produce the layout of the bathrooms for the charity. As mentioned in prior newsletters, the charity will be taking clothing to Moldova to donate to the locals in the village where the team will be working. The aim is to open up a room at the school for the locals to come and choose the clothing they require ( a free 'shop' format). If you would like to donate items then please do so in May so that we have time to sort and add items to our customs list. If you would like to send items through BT to us, then please get in contact for more details. If anyone has any contacts to source carrier bags (or other bags) then these would be useful in the 'shop' for locals to take items away in. We still also require paint of varying colours, so that murals can be painted around the school by volunteers. 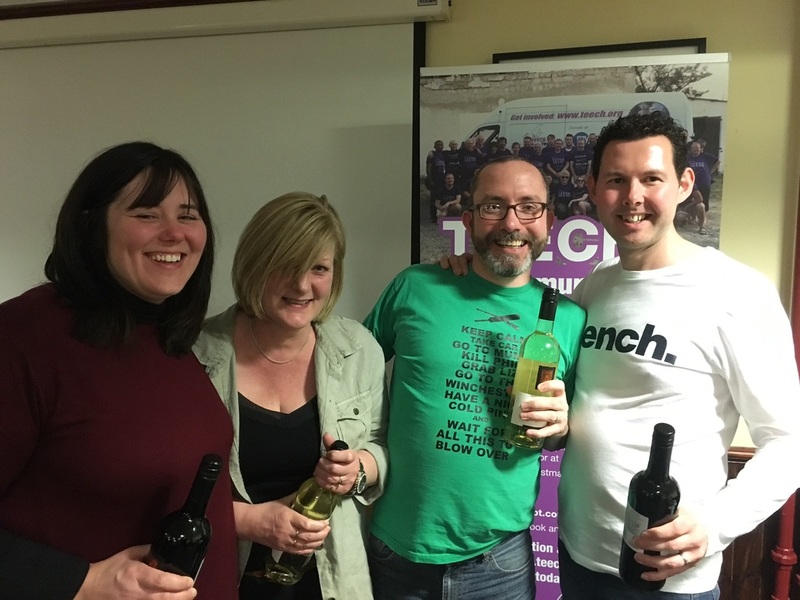 TEECH Volunteers Matty Steward, Stig Steward and Kev Darby held a successful quiz night to raise funds for the 2016 Moldova mission. Held at Foxhall Community centre in Ipswich, around 80 people came to hear quizmaster Stig ask questions on many subjects. Eleven teams battled it out for the title with the winners (seen below) taking the prize with just over 100 points. With a brilliant raffle and stand-up sit down card game adding to the pot we managed to raise £375 for the trip. Special thanks to the venue for letting us have it free of charge, all the great people and businesses who donated prizes and all our friends and families for helping make the night such a fun and special occasion. Roll on August. ​Volunteer Charlotte Adams jumped out of a plane on the 25th March to raise money for TEECH. Charlotte will be joining the team for the first time this August as we head to Ivancea. 'I travelled to Hibaldstow airfield in Lincolnshire on the 25th March to skydive 15,000ft out of a plane. It was the most amazing experience and I would recommend it to anyone. I choose a great day to do it and the views were breath-taking. I would definitely do another one'. The next packing date is Saturday 14th May.